MyMemories Blog: Meet this week's *Featured Designer* - it's Barbara Ryan!! Meet this week's *Featured Designer* - it's Barbara Ryan!! It's another FUN DAY MONDAY here on the MyMemories blog!! You know what that means...? Of course! It's time to meet another of the *Amazing* MyMemories Designers! This week it's one of our long-time friends, Barbara Ryan!! Barbara has been with MyMemories for quite a while and always continues to have awesome fun new things in her shop!! Be sure to check it out! She's got a GREAT SALE set up this week to celebrate her feature week here on the MyMemories blog!! Hi, my name is Barbara and I live in the Capital District of New York State. I'm married and the mom of 2 boys who are now nine and six years old. Wish me luck with 4th grade math this year! I started digital scrapbooking in 2007, joined a few creative teams, and then began designing in January 2008. I'm most influenced in my design by my boys as you may be able to tell. When I am not designing or with the kids, I like to walk, read silly romance novels and am perpetually planning Disney vacations. I've been with My Memories since very early on and it's been wonderful to watch them grow! Barbara is excited to offer a great prize this week of THREE $25.00 shopping sprees to her shop!! So be sure to take a peek and comment below with the name of YOUR favorite kit and you could be selected as one of this week's LUCKY DUCKS! Good luck! Be sure to take a peek at Barbara's FB page and follow her on Twitter too! LAST week's winner will be posted shortly!! Mel will pick the winner! Thank you so much for this post. I want to let you know that I posted a link to your blog in CBB Digital Scrapbooking Freebies, under the Page 4 post on Oct. 15, 2012. Thanks again. I had much trouble choosing a favorite! 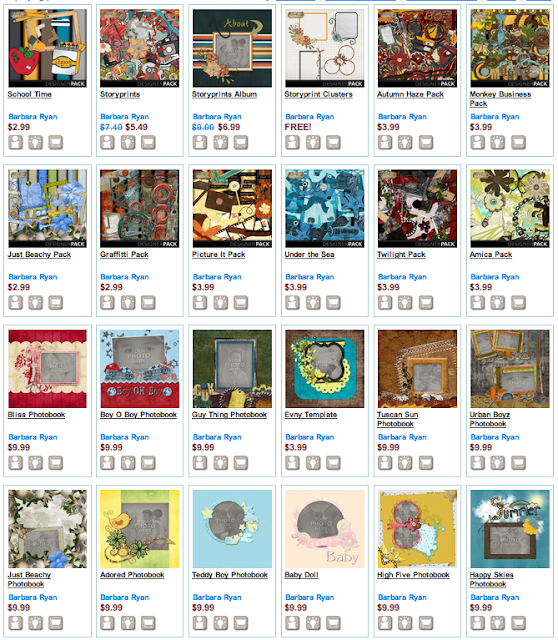 I've added Beachy 5x7 , Victorian papers, and Spring Showers overlay to my wish list. There were several others so I will be revisiting your site when I'm on my computer and not my tablet! I love your style, I picked up Road Trip for a project I am working on. LOVE IT! Your artsy and urban edge paper packs have been on my wishlist for quite some time now :) Thanks for sharing and the chance to win! magical christmas is one of my favorites although I have several of her kits on my wish list. I love Dotty4U! so cute! All of them are great though! I really like Dotty4U and LOVE the textures of the Artsy Paper Pack. Autumn Haze...I love anything Autumn!! Super Kits! I love Just Beachy! thanks for the chance! I have several of your designs. Storyprints is on my wishlist. It looks like it could be used in so many ways. I love Urban Boyz. Congratulations on being Designer of the Week. Thank you so much for the chance to win. I live in coastal North Carolina so I lean a little toward the Just Beachy pack. But if pinned down I would have to choose the Autumn Haze because of the colors. I can't really pick a favorite. I love the Just Beachy kit and the whimsy of Under the Sea is so cute. I think I would use Amica the most because it is lovely. I love your designs! I am new to MMS so I am enjoying exploring all the deisgners available!